Are you a fangirl? Do you geek out over Star Trek, know every YA novel headed for the big screen, or wish Sherlock and John Watson would just hurry up and get it on already? Let’s be real: when you heard the title of this book, you either squealed with joy or said “meh” and moved on. If you are a fangirl in any way, shape or form, this book is for you. I especially love the informal Q&As with celebrity geek girls — and my own fangirly little heart skipped a beat when I saw Kate Beaton was included! Maggs also includes some girl power type chapters on contemporary feminism, which in the light of things like Gamergate, is particularly relevant to any geek girl. Maggs’ message is simple: don’t let anyone ever tell you that you’re not geek enough. And that’s a message worth hearing. Maggs includes a variety of geeky topics in this book, which is particularly useful for anyone who wants to try out another geekdom. For example, I’ve been intrigued by superhero comic books, but I never knew where to begin. I’ve always found comic book stores pretty intimidating. It’s hard to ask for advice about where to start, when everyone around you appears to know exactly what they’re looking for, and even when you find a series you’d like to try, it’s hard to find a good issue to start with. Fortunately, Maggs includes some book recommendations in her introductions to Marvel and DC fangirls, so maybe I’ll give those a try. 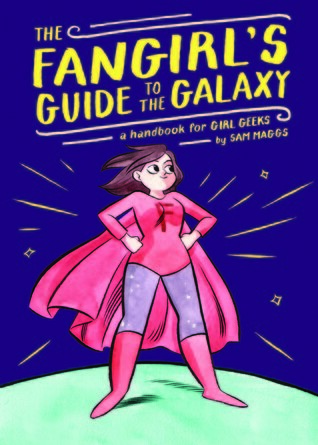 She also includes a chapter on kickass heroines to check out in various media, as well as a list of geek girl-type websites. There are a lot of books, movies, TV shows and websites I haven’t tried out yet, and I can’t wait to get started! It’s a wide galaxy for fangirls out there, and Maggs provides us with a fun roadmap into what we can do with our fandom. This entry was posted in Book Reviews and tagged 50BookPledge2015, ARC, Non Fiction by Jaclyn. Bookmark the permalink.